Calcined from High Purity feed material, Microlux Alumina is produced to exacting specifications to assure you, our customer, of the finest Alumina available today! REGULAR GRADE… MICROLUX-R Alumina tends to have larger particles due to the agglomeration of smaller particles. For this reason, it has been the choice of Optical Technicians and Metallurgists for over 25 years. Microlux Regular Alumina starts off as a very aggressive grinding and lapping medium that cuts very quickly; however, because of its composition, it breaks down readily under pressure to provide excellent final lapped or polished surfaces. Microlux Regular Grade Alumina also has found use in filler, filter, metal separation, and a wide range of other applications. DEAGGLOMERATED GRADE… MICROLUX-RZ Alumina has a highly controlled particle distribution produced by a proprietary separation process that delivers particles that retain their fine dispersion over years of shelf life while maintaining its high purity and the unique characteristics of each platelet. Although originally created for high-purity ceramic applications, Microlux-RZ has found its greatest usage as a fine grinding and polishing medium when used in conjunction with large micron grinding mediums. Microlux-RZ has been especially successful for ultrafine polishing of semi-soft crystalline and composite materials. 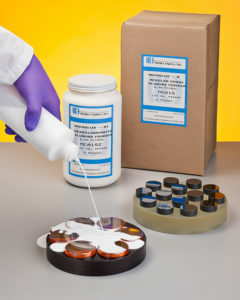 Microlux-RZ is also used as a filler for magnetic mediums, plastics, binders, strengthening composite materials, armour, and for ultrapure ceramic applications where packing density is critical. Microlux Alumina is packaged in 5 lb. plastic bags placed in protective cardboard containers. 5lb MINIMUM ORDER Contact Us for more information.